Happy New Year – after the frivolity of the festive season it’s time to get back to some serious stuff – but don’t panic the gardening vicars will return to lighten the tone again next week! 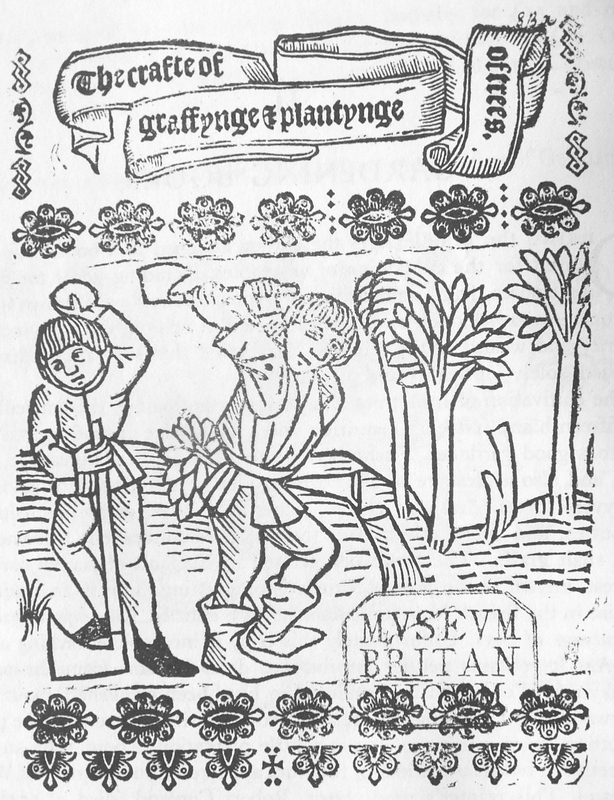 To be absolutely honest the first work of any gardening-related interest published in England is actually a little pamphlet printed by Wynkyn de Worde around 1520. But its hardly a book and certainly not great literature. Instead it’s just a short tract on how to plant and graft trees, although the illustration on the title page makes it look more like how to cut them down. The whole work is derived from the 4thc Roman writer Palladius, and was printed in at least three editions, with additional bits and pieces of no great interest to horticulturalists. 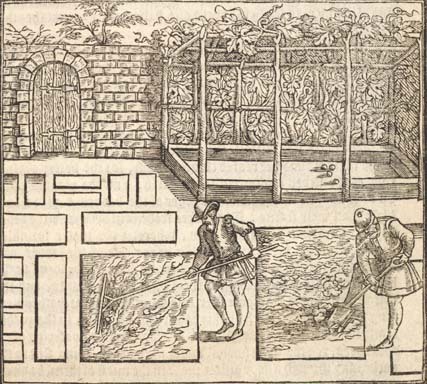 Leaving that aside the first real gardening book published in England is Thomas Hill’s A most briefe and pleasaunte treatise teachyng how to dresse, sowe and set a garden which was published in about 1558. Containing only 42 pages it certainly was brief. 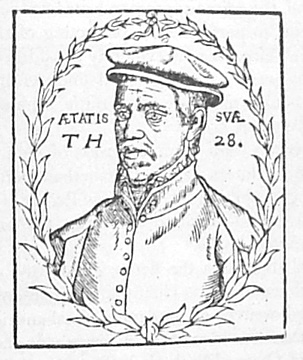 Thomas Hill is described at various points as a citizen of London (which meant he was a member of a livery company although it’s unclear which), Londoner, and “Gent” which although it is a self-assumed title, suggests he was at least relatively successful as a writer. He was also quite educated, and could read Latin and possibly Greek as well, since he quotes authors who had not, as far as I am aware, by then been translated into English. 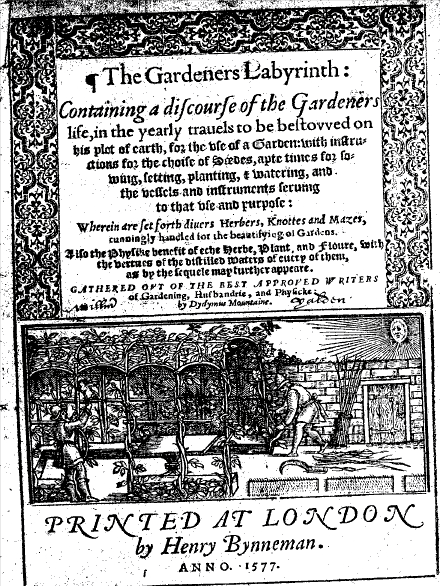 The title page contains a woodcut of a small formal garden. In the centre is what appears to be a central knot, surrounded by a series of geometric flower beds, crossed by narrow paths and enclosed by trellis panelling and columns. Outside that, and set against the outer boundary, are larger rectangular beds, an arbour, well and a pedimented gateway. Finally, surrounding all that is a paling fence either covered with creepers and climbers, or backed by a hedge. The view is probably drawn as if from a terrace outside the house. The image is quite well-known because it was copied and used several times in other books. This is nothing unusual as the blocks were expensive, and similar things happened to most illustrations, to save the printer money. 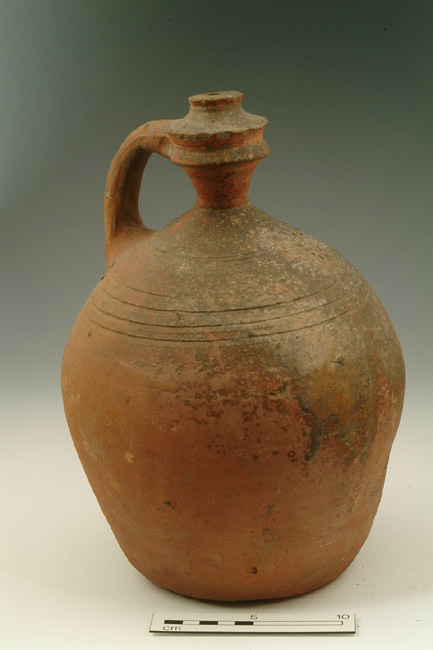 The text is mainly advice on matters relating to gardening that Hill had extracted from classical writers including “Palladius, Columella, Varro, Ruellius, Dyophanes, learned Cato, and others many moe” and which he had “englished”. It reads almost as if he had a pile of books in front of him as he was writing and extracted a quote from each in turn – which is perhaps what he did. The first chapter is “a most brief treaties of the dressing and sowing of gardens and of the placing of Gardens”. It opens “it is right necessary sayeth Varro …” which gives us instantly a classical authority for what follow, and this is the pattern he sets throughout. Then follow short chapters including “the consideration and chusying of good and excellent grounde”, and “digging and disposing of the quarters” although the longest part by far is a list of plants, and more practically, the times for “sowing and dressing seeds” and “setting plants” in the garden. 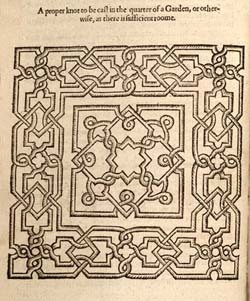 Interspersed are two woodcut plans for mazes which are very similar to the ones drawn later by Androuet de Cerceau in his engravings of the Château at Gaillon. This had been built for the Cardinal d’Amboise, and was contemporary with Cardinal Wolsey’s Hampton Court. This might suggest that either Cerceau copied Hills design or much more likely there was an earlier image now lost which both writers had access to. 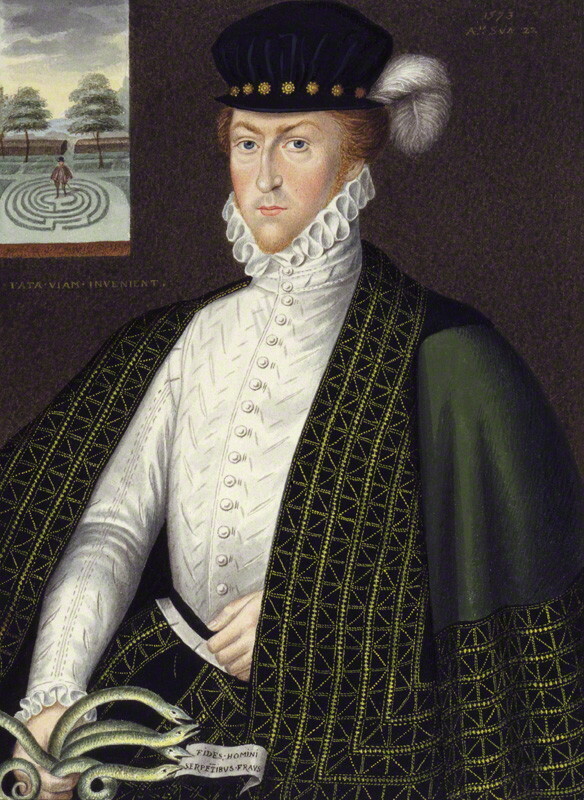 They are complex compared with other known images of Tudor mazes, the first one especially so, as can be seen from the maze in the background of this portrait. Nevertheless, Hill or the printer liked the second one so much it was included not just in the preface but again later in the main text! The little book was obviously quite successful because it was extended to 68 pages and reprinted in 1563.It was then enlarged again and renamed in 1568 when it appeared as The proffitable arte of gardening now the third tyme set fourth. Other editions were published until the beginning of the 17th century. One of these included a section headed the booke of the art or craft of planting and graffing which was the simplified version of the Wynkyn de Worde pamphlet I mentioned in the opening paragraph. And like publishers today, Hill’s threw in a few free supplements to the main text…or as he put it: he added muche necessary matter. 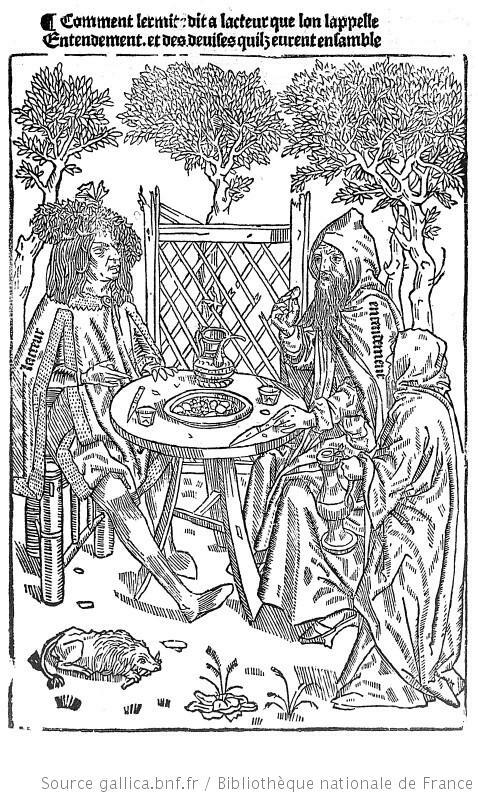 There were “a number of secrettes with the phisick helpes belonging to eche herbe”, and “To this annexed, two propre treatises, the one entituled The marueilous gouernment, propertie, and benefite of the bées, with the rare secrets of the honny and waxe. 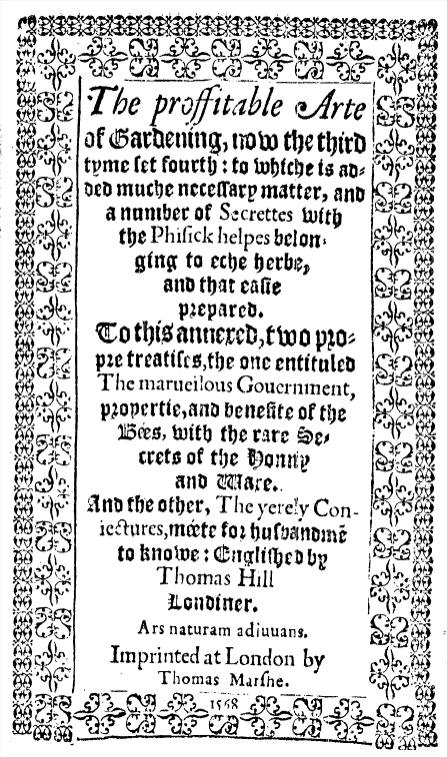 And the other, The yerely coniectures, méete for husbandme[n] to knowe: Englished by Thomas Hill Londiner. All this took the book to over 300 pages although apart from repeating the earlier illustrations there are no other pictures which sadly still makes it rather an uninteresting read. The proffitable art was republished at least four times in the following 10 years and at least twice more before 1608. Some included the “extras” and others didn’t. The printing blocks were probably just sold on and the printer did as he pleased with them. 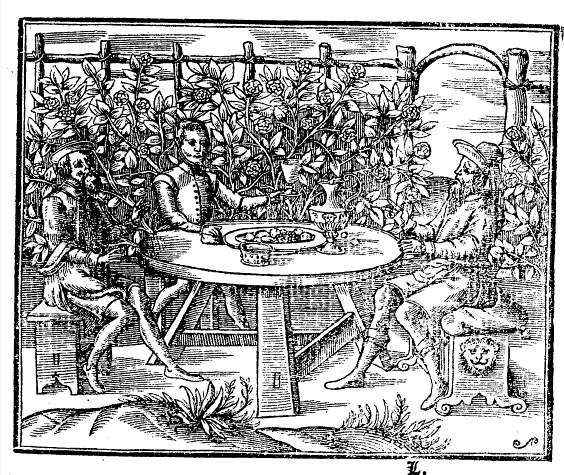 Hill died sometime in the mid-1570s and his second gardening book The gardeners labyrinth appeared posthumously in 1577. Published under the pseudonym of Didymus Mountain it was finished and published by his friend Henry Dethick. He dedicated the text, despite “its vulgar stile”, to Sir William Cecil, Elizabeth’s chief minister and himself an extremely keen and innovatory gardener. 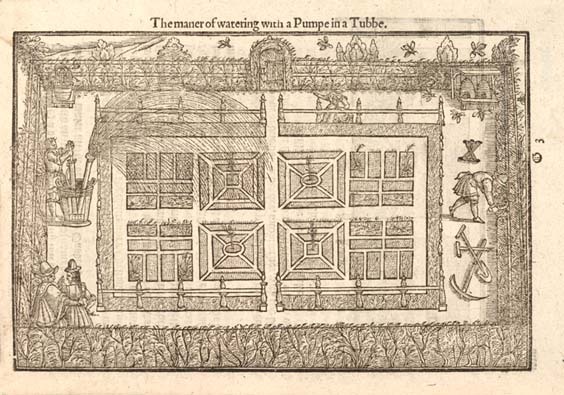 It has 69 short chapters containing ‘instructions for the choice of seedes, apt times for sowing, setting, planting, and watering, and the vessels and instrumentes serving to that use and purpose’ and sets forth ‘diuers herbers, knots and mazes, cunningly handled for the beautifying of gardens’. 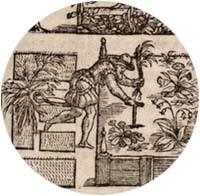 A proper knot to be cut in a quarter of a Garden, or otherwise, as there is suffcient roome, from1594 edition, p.
The number and quality also suggest that the printer/publisher was anticipating high sales because woodcuts, especially ones as fine as the new ones included here, increased the cost of publication very substantially, and investment in them wouldn’t have been financially worthwhile otherwise. Academic estimates suggest the blocks of this quality would probably have doubled the cost of the book (FR Johnson, ‘Retail Book Prices 1550-1640’ in The Library, 1950). Blanche Henry (British Botanical and Horticultural Literature before 1800) details the debate about the provenance of the blocks, suggesting that the printer Henry Bynneman was one of the outstanding printers of his age and employed many foreign artists, or perhaps bought or commissioned the blocks abroad, probably Antwerp. Although, once again Hill sticks very largely to classical authorities there are signs that show he was actually in touch with the contemporary garden. But what was new was “the watering pot Best to be liked and handsomest for this turn both for the fine sprinkling for and easy carriage of water… Is that much used in the chiefest gardens about London and in divers parts of England… The body wholly made of copper having a big belly and narrow neck, a strong handle of the same metal workmanly fastened to the belly and head to carry the pot if need be to place in the garden: but for a more easiness and quickness in carriage of the pot upright and full, is another strong ring or handle fastened heartily to the lips of the pot… (Which)… Service to sprinkle forth the water by the long pipe full of little holes on the head…”. 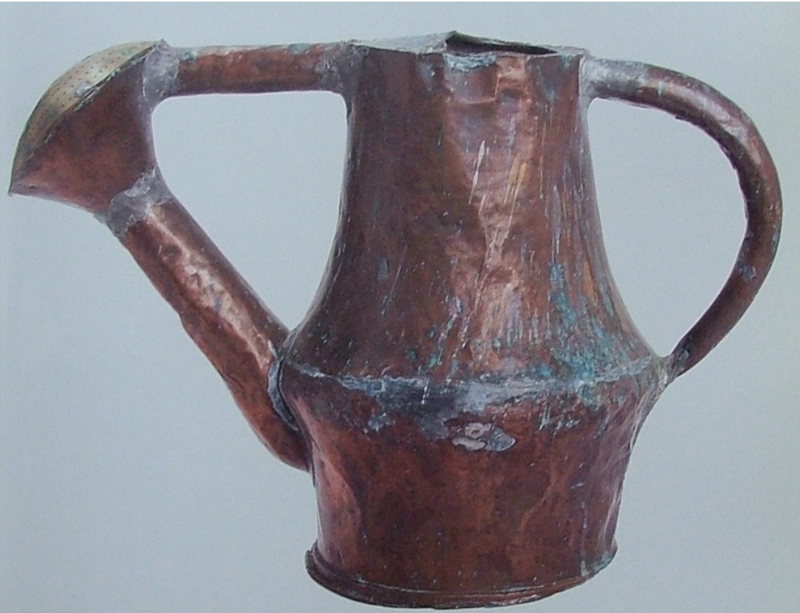 In other words a modern watering can. Another innovation that Hill records was also to do with watering. 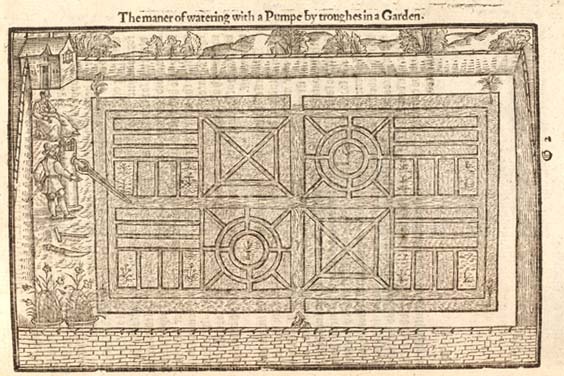 He includes an illustration showing the use of a pump to flood troughs in the garden. 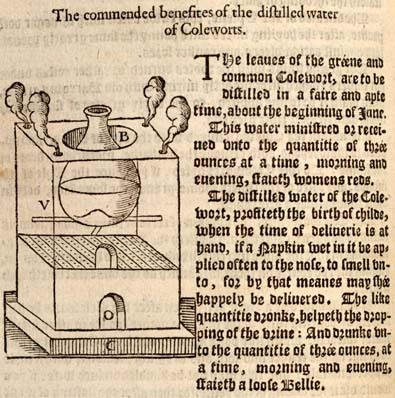 “There may be some water their gardens with great squirts made of tin… Draw up the water, set the squirt to the breast and force the water upwards so that the water in the breaking may fall as drops of rain upon the plants…”. There is also a charming one of three men relaxing in an arbour, seated on benches at a three-legged table and surrounded by a splendid climber in full flower. 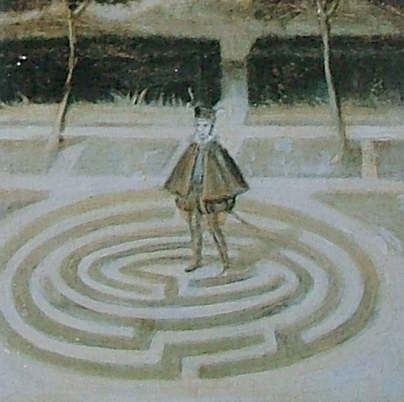 Blanche Henry thinks that it is likely this was probably based on an illustration in a French text Le Chevalier Delibere by Olivier de la Marche. The second half of The gardeners labyrinth has a “necessary table” listing the medicinal uses of 60 plants from angelica to valerian with an account of the waters that may be distilled from them. For onions, for example, there is a note of over 40 uses: they maintain health, cure ulcers, remove spots, profit at the years running, remove grease from the stomach, clear the eyes, recover hair shed away, deal with the biting of a mad dog, help ulcers of the privitys, stop noise and pain in the years and grief of the loins…But… They also have a downside and engender ill humours, procure first, swellings, indigenous, headache, and cause one to become foolish amongst other things. Its almost enough to stop you ever cutting up an onion again! 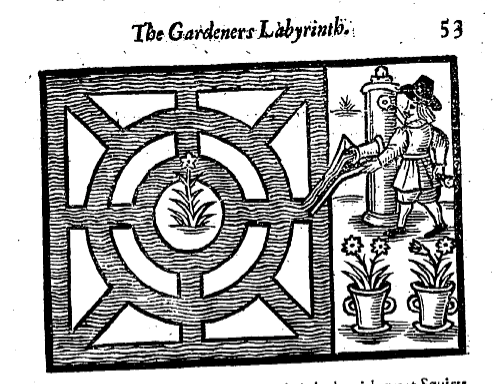 Surprisingly Hill’s books are not freely available on-line but there is a very nice edition of The Gardener’s Labyrinth edited by Richard Mabey, (Oxford, 1987) which has lots of other contemporary images to help elucidate the text. It is based on the 1651 edition, and leaves out Hill’s astrologically based notes on the medicinal uses of plants. 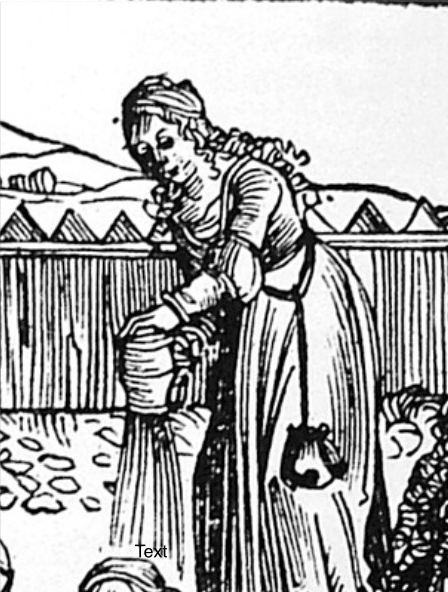 However it does still include most of the original woodcuts and some new illustrations of mazes and gardeners working including another watering scene…. This entry was posted in Uncategorized and tagged knot garden, maze, Thomas Hill, Tudor, watering. Bookmark the permalink.